From position A, the bob of the pendulum has fallen through a distance l cos 30º (fig.). Therefore, the loss of potential energy is mg l cos 30º = (mgl√3)/2. Therefore, the gain in kinetic energy by the bob (by the law of conservation of energy) is (mgl√3)/2. 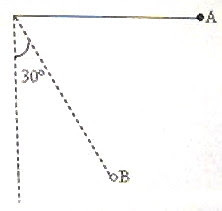 You can use the figure used with the previous question for working out the present question as well since the angle turned is 60º. The loss of potential energy by the bob on swinging through 60º is mg l cos30º itself. [Or, you may take it as mg l sin60º]. Or, (mgl√3)/2 = 0.5 J. The kinetic energy when the string becomes vertical will be mgl since the bob falls through a distance l and loses its entire initial potential energy mgl. From the above equation mgl = 1/√3 J [Option (b)]. [Note that the mass of the bob given in the question just serves as a distraction]. You will find some useful questions in this section here. 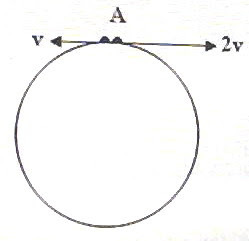 Two small particles of equal masses start moving in opposite directions from a point A in a horizontal circular orbit. Their tangential velocities are v and 2v respectively as shown in the figure. Between collisions, the particles move with constant speeds. After making how many elastic collisions, other than that at A, these two particles will again reach the point A? 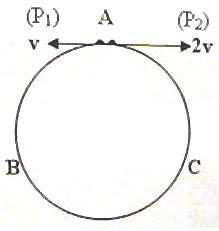 Particle P1, after traversing one third (AB) of the circular track in the anticlockwise direction, will collide with particle P2 at position B. This collision occurs when the particle P2 has traversed two thirds (ACB) of the circular path (since the speed of P2 is twice that of P1). Since the collision is elastic and the particles are of equal masses, their velocities are interchanged. P1 now travels in the clockwise direction with speed 2v and P2 travels in the anticlockwise direction with speed v. The second collision takes place at position C. (BAC is two thirds of the circular path while BC is one third of the path). The second collision at C results in the reversal of the velocities and P1 now travels in the anticlockwise direction with speed v where as P2 travels in the clockwise direction with speed 2v. Therefore, the third collision will occur at A. Since the third collision at A is not to be counted, the answer is 2 [Option (c)]. Two small particles of equal masses start moving in opposite directions from a point A in a horizontal circular frictionless track. Their speeds are v and 3v respectively as shown in the figure. After making how many elastic collisions, other than that at A, these two particles will again reach the point A ? You can easily arrive at the answer which is 3 [Option (b)]. 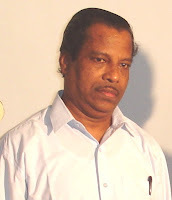 The Commissioner for Entrance Examinations, Govt. of Kerala, has invited applications for the Entrance Examinations for admission to the following Degree Courses in various Professional Colleges in the State for 2010-11. Application form and Prospectus will be distributed from 07.12.2009 to 06.01.2010 through selected branches of Post Offices in Kerala and outside the State. The amount towards the fee of application (Rs. 700/- for general candidates and Rs.350 for SC/ST candidates) is to be remitted in cash at the Post Offices. To find the list of post offices, selected as sales centres, and details of additional fee of Rs.8500/- in the case of candidates opting Dubai as the centre of exam, visit the site http://www.cee-kerala.org/. Online submission of application is possible in the case of candidates claiming no reservation benefit and those belonging to Non-Keralite category. See details at http://www.cee-kerala.org/. Candidates seeking admission to B.Arch. course should also submit their application to the CEE. There is no state level Entrance Examination for this purpose. These candidates should write the National Aptitude Test for Architecture and should forward the NATA score and mark list of the qualifying examination to the CEE on or before 05-06-2010. If you want to see earlier KEAM questions discussed on this site, type in ‘Kerala’ in the search box at the top left of this page and strike the enter key or click on the search button. 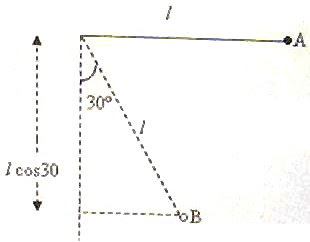 This question appeared in EAMCET 2009 (Engineering) question paper. In circuit A both diodes are forward biased and hence the circuit reduces to two 4 Ω resistors connected across the 8 V battery. Since the parallel combined value of the two resistors is 2 Ω, the current delivered by the battery is 8 V/2 Ω = 4 A. In circuit B one diode is forward biased and the other diode is reverse biased and hence the circuit reduces to just one 4 Ω resistor connected across the 8 V battery. The current delivered by the battery is therefore 8 V/4 Ω = 2 A. The correct option is (3). (2) In the following, which one of the diodes is reverse biased? You should note that all potentials are with respect to the ground. Therefore the diode in circuit (1) is reverse biased. [In circuit (2) the anode of the diode is at a higher positive potential compared to its cathode and hence it is forward biased. In circuit (3) the cathode of the diode is at a higher negative potential and hence it is forward biased. 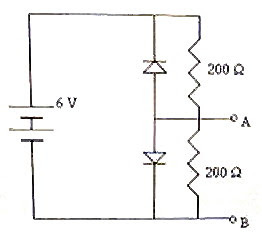 In circuit (4) the cathode of the diode is at a negative potential and hence it is forward biased]. 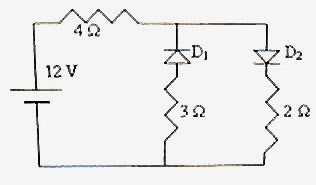 (3) The circuit has two oppositely connected ideal diodes in parallel. 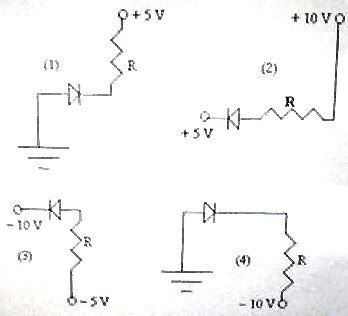 What is the current flowing in the circuit? Since the diode D1 is reverse biased, no current will flow through D1 and the 3 Ω resistor. The current delivered by the battery is limited by the 4 Ω and the 2 Ω resistors only and is equal to 12 V/(4+2)Ω = 2 A. The upper diode is reverse biased and can be ignored. The lower diode which is connected across the terminals A and B is forward biased and hence keeps the voltage across A and B at 0.7 V [Option (d)]. [You can use the voltage drop across a forward biased diode as a small reference voltage in electronic circuits just as you use the relatively larger breakdown voltages of reverse biased zener diodes].